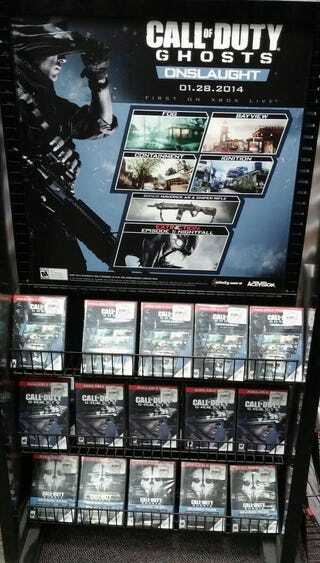 This is reportedly a GameStop promotional poster dating Call of Duty: Ghosts' first DLC installment, Onslaught for Jan. 28. It was tweeted out yesterday and picked up by the Call of Duty enthusiast site CharlieIntel. It describes four new maps—Fog, Bayview, Containment and Ignition—and two bonus weapons. Episode one of the Extinction-mode narrative announced back in mid-December also is included. I've emailed an Activision representative to ask what's up, and if there's any additional information to share. We'll update if he replies.